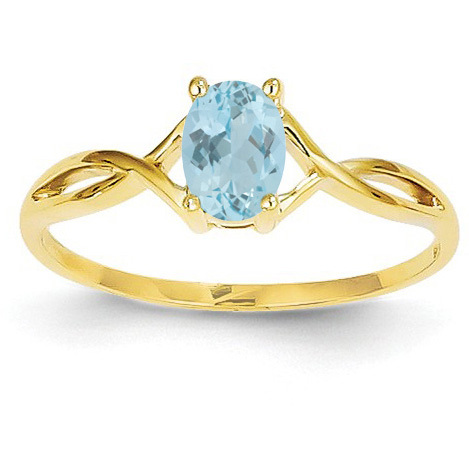 An aquamarine gemstone is at the center of this fun, twist design aquamarine birthstone ring from Apples of Gold Jewelry. A 14K yellow gold band with a twisting design that loops around an authentic icy aquamarine gemstone creates an interesting look that you can't help but want to wear every day! The widest part of the ring measures 6mm in size, and the aquamarine stone, which is an oval cut stone, measures 6mm x 4mm, which is a lovely size for the gemstone to really stand out. We guarantee our Twist Design Aquamarine Birthstone Ring in 14K Yellow Gold to be high quality, authentic jewelry, as described above.